(1) Preheat oven to 175°C. Lightly grease a baking dish. (2) In a large pot of salted boiling water, add the macaroni and cook it till just right i.e. do not overcook it because it'll be further cooked in the oven. (3) Whisk the egg, milk, butter and cheese. Mix well. 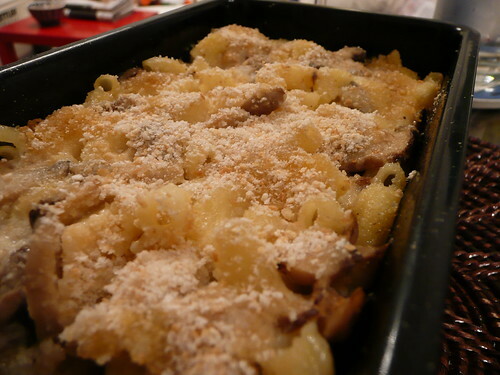 (4) Place the cooked macaroni in the baking dish. Pour the liquid mixture over the macaroni, sprinkle with salt and pepper and stir well. Press the mixture evenly around the baking dish. (5) Sprinkle a layer of bread crumbs over the mixture. (6) Cover the baking dish with aluminium foil and bake for 25mins. (7) Uncover the baking dish and bake for a further 15 mins or until the top is slightly browned before serving. (+) A fairly easy recipe to follow. The quantities of the various ingredients are not stated here because it should be added according to your own liking i.e. more cheese if you prefer a cheesy bite to it or more milk if you prefer the pasta to be more wet after baking.